Remember how I told you I LOVE cranberries? Well, this is another recipe that I make every year around Christmas time. I’m always looking for short-cuts when baking for the masses. This cranberry bar recipe uses a boxed cake mix and makes a full 9×13 pan of bars. I’ve been known to eat these for breakfast and a midnight snack. In a medium saucepan over medium heat, combine the cranberries, white sugar and water. Cook, stirring occasionally, until all the cranberries pop and mixture is think. About 15-20 minutes. Remove from heat and let cool. In a large bowl, mix together the cake mix, melted butter and eggs. Stir in the oats, brown sugar, ginger and cinnamon. Set aside about 1.5 cups of the mixture and spread the remainder into the bottom of a 9×13 pan (it is MUCH quicker if you use your hands) packing down to form a solid crust. Spread the cooled cranberry mixture over the crust. 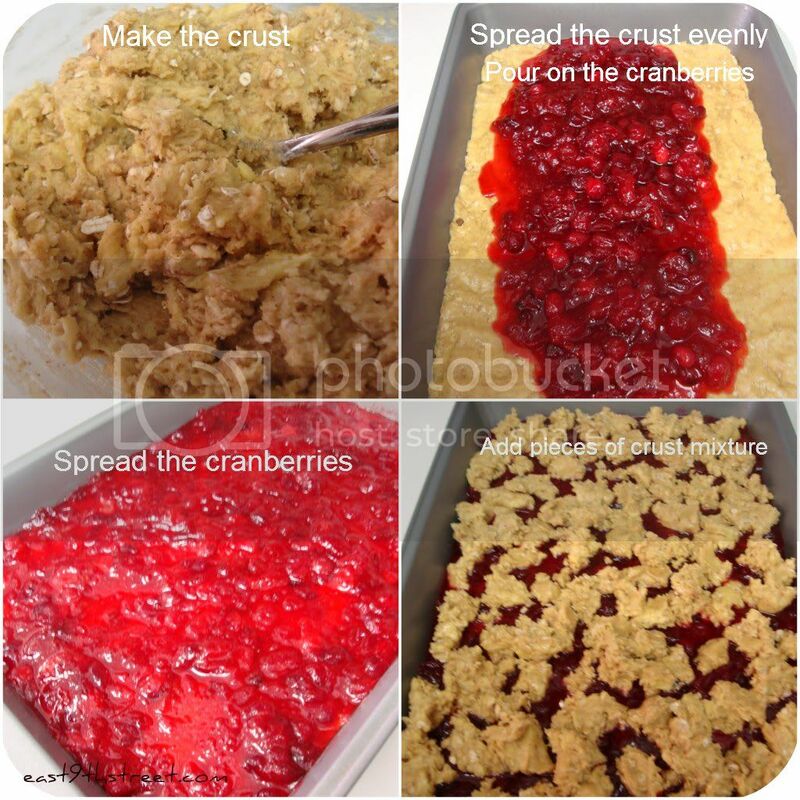 Pinch off pieces of the remaining mixture and place over the cranberry layer. Bake for 30-35 minutes or until the top is slightly brown. Cool in the pan for an hour before slicing into bars. Your finished product should look like this. I usually cut them in 1 inch pieces so I can easily pop one in my mouth whenever I want. With all the chocolate and fudge during the holidays, having something fruity and sweet is a nice alternative. Have fun baking and let me know what you think! Yes please! What a delicious looking treat. Oh my those look awesome! You have some great recipes on the site! If you would like to – I have a recipe linky (see recipe therapy in header) – you can add as many as you like! Thanks for sharing! I am not a fan of cranberries, but those look delicious, so might have to try them out! oh wow those look so yummy! and they dont seem hard to make at all! i think im gunna have to try making these! i know my mom would love them! i am going to print the recipe off and when i go back home for a night im going to get her to make them with me! thanks for an awesome recipe!